In the fabled underworld of shadows and peril, legendary heroes are forged. Those who enter take but their wits and their brawn to face off against monsters and shadows of former companions. Are you brave enough to enter the labyrinth? 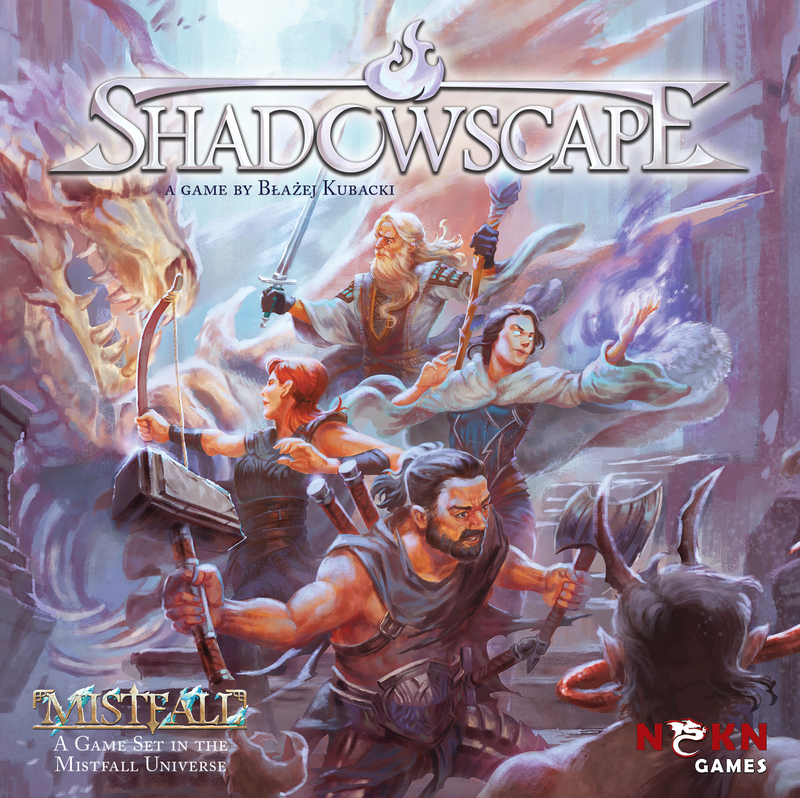 Will you emerge as the champion of Shadowscape? Shadowscape is a mini-dungeon crawl game set in the rich universe of Mistfall and Heart of the Mists. Designed by Błażej Kubacki, it plays in 60 minutes or less, and can be enjoyed by 1 to 4 players competitively, or cooperatively. It can also be played solitaire! The dungeon is randomly built at setup, making every game play differently. Up to 4 players compete or cooperate to fulfill a set of random objectives. Players can choose from a complete set of 13 Heroes introduced in Mistfall and Heart of the Mists each with their own unique powers and abilities. Each Hero can be further customized in game with new skills and equipment gained as the game progresses. Each turn players manage a tableau of double-sided skills, as well as a hand of Fate cards to outmaneuver other players, eliminate monsters, and fulfill objectives. Simple and fast automated enemy movement make the dungeon both alive and dangerous every turn. Right from day 1 of the Kickstarter campaign, a premium Print and Play will be available, so you can start playing immediately long before a production copy arrives at your door! If you’re among the wonderful supporters who helped us bring Heart of the Mists to life, we will have a special offer for you, which will allow you to upgrade your copy of Shadowscape with a set of any Stretch Goals we manage to unlock during the campaign. You already have your game, now join us on November 14th, and help us make it even better for you! Don’t miss the starting date: November 14th on Kickstarter.